The High Drag Podcast found it’s roots in the awesome organization of Red versus Blue. Inspired by the Eve Online game, and more importantly, the Eve Online Community, the original three members of the cast came together in between glorious frigate explosions to have a few drinks and talk about balancing our Eve lives with our real ones. What started out solely focused on RvB PVP eventually evolved into the show we have today. Covering news, politics, ship fittings, faction warfare, new player experiences, industry, solo PVP, beards, and so much more, we think we have really hit out stride. We have been doing this cast for almost a year, can be found on Stitcher and Itunes, and will continue to do the cast as long as you keep on listening. We should also clarify what “High Drag” means. High Drag is a play on the phrase “High Speed, Low Drag” which is an American Soldier Idiom that means something is “cool”. 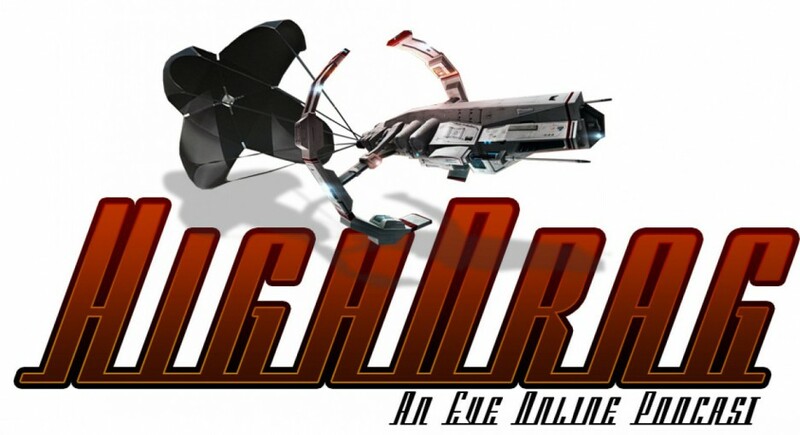 Since, according to the Eve Online Lore, our ships’ warp drives create a considerable amount of 4-way drag on the ships we fly, I shortened the phrase to “High Drag”. I wouldn’t try and make too much sense of it, like the show, we picked the name and went with it. Awesome, yeah no kidding, come on in… the space is fine! Recently returned to EVE and catching up on my podcast listening. Found you guys and really enjoy the show. Your talks about traveling through null sec gives me hope that I’ll actually be able to complete my journey. Fly safe! Love the show. Who’s the vet? I heard “high drag” scratched my head and had to listen. Keep it up. Once again, love the show guys! Still a newbro in EVE, and finally decided on what I want to do for my career 😀 Salvaging ftw. Only problem is I want to do lowsec salvaging, but I just can’t seem to survive there. Any pointers on staying alive, salvaging, or just plain not sucking at EVE? Lol 🙂 WHEN IS YOUR NEXT SHOW?! I need mah High Drag! 2. Develop relationships with key leaders in faction warfare.. The idea is to develop a network that will inform you when large battles will take place… If you have the network, you have a good source of salvage ( this is part of the salvager meta game). 3. Learn to fly an astero or a prospect. In my opinion, cloaky salvage ships are really fun to fly. Both have a decent cargo hold. Also, if you need help with any of this, contact me in game.. I,d love to go on a salvage roam with you. Still the best podcast in Eve. Looking forward to the next episode. I do like show, but I definitely enjoyed it more in the past when there was at least a passing attempt to keep it family friendly. Are those days gone for good? Generally I’d say no, but there are always slips. Some intentional, some not so much. Sorry about that, but the podcast is listed as “explicit”.